After nearly 2 weeks, digesting both the trip and the play (I still haven’t really landed in London yet, it’s a weird feeling), it’s time for a personal review of The Vertical Hour. I warn you up front, it has become a long post, that’s what happens when my heart takes over from my head. If you haven’t seen the play you might not be interested in reading it at all. If you still have to see they play (lucky you) you might want to wait reading it until you have seen it, although I promise not to tell you how it’s ending. I felt the need to write it down, so here you go. And there is a beautiful song to hear in this post, I promise you that. So first of all, do yourself a favour and press play, so you have the right background music to read all this. Imagine hearing the first tunes of this exact song, and on those tunes, while the curtains are still closed, Bill Nighy’s long and lanky body starts walking up the stairs in front of it, on to the stage only a few meters in front of you. Sam Mendes picked this song I read in a interview, and it’s one of Bill’s favourite Dylan songs. Title? Simple Twist of Fate. An excellent title for a song which fits perfectly to the play itself, to the fact that Bill (a huge huge Bob Dylan fan) is in that play, and my whole presence in the theatre is one simple twist of fate too. In my case – there was this film that eventually brought me to New York to watch this play with that excellent actor. Fate is an interesting concept. Needless to say that that song will be forever on my play list from now on, and it makes my heart beat a bit faster when I hear it. The harmonica in it is a bonus, I love the harmonica. For the purists, there are 2 more Bob Dylan songs in the play : is a very short clip from Meet me in the Morning, and in the break of the play, you get Shelter from the Storm completely, all three songs come from the same Bob Dylan album : Blood On The Tracks. OK, let’s leave Bob Dylan for a while. I didn’t know much more about the Vertical Hour than that it had Bill Nighy, Julianne Moore and Andrew Scott in it. And that David Hare had written it, and that Sam Mendes directed. No chance this could go wrong I thought. I had seen another David Hare play and loved it, Sam Mendes has directed one of my favourite films ever and hey, Bill Nighy was in it. The set design was absolutely beautiful, a gigantic tree on stage, and the lightning was magical, a very real reflection of the change of colours from daylight to night and from dusk to dawn, and also following the development of the characters and their relations in the play. The set reminded me bit of the set of A moon for the misbegotten. Simple, yet very effective. What did I expect? I expected a play filled with a lot of political discussions about Iraq and the war. But the play turned out to be much more than that. When Bill Nighy in on of his many interviews said that it was actually a comedy, I didn’t really believe him. Surely there is a lot of talk about Iraq in the play, and it is clear from the beginning who is in favour and who is against the war. Oliver Lucas (Bill, playing a doctor) leaves no doubt why he is against “Let’s just say, I knew who the surgeon was going to be, so I had a fair idea what the operation would look like.” A clear message, causing a lot of response from the audience. However, if you would cut away all the Iraq talk from this play, what you would have left would be a story about three very different people, who all three, in their very own way are trying to find answers in this quest called life. 3 people with different backgrounds, a father, his son, and his sons girlfriend, all somewhat lost trying to find their way. It is a beautiful tangled story about love and relationships, about fate and redemption and about finding yourself. 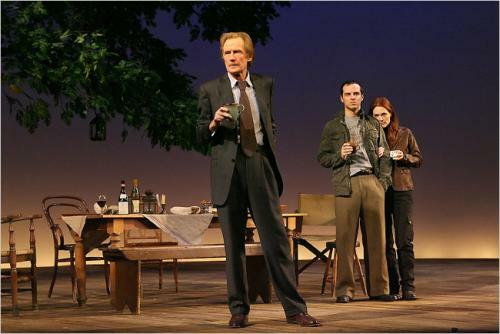 And Bill Nighy was right, he surely has a lot of really funny lines, and generally there were loads of things to laugh about in this play. He is excellently slick as the womanizer he played in this play, he can seduce you with his eyebrow, and he is absolutely believable as the doctor, who decided to retreat to a place as far out as Shewsbury in Shropshire, where “he could do no harm” after some things have happened to him. Julianne Moore has the difficult task of convincing us why she is supporting the war, which is a tough task, but she does it well, and I don’t really understand all the critique she has received for her role. And Andrew Scott is an actor I will definitely see more of should he come back to a theatre in London. He was absolutely convincing and fantastic, playing Bill’s son. Last but not least, The Music Box theatre is a beautiful theatre, old and stylish, a perfect place for a play like this. Big enough, but not so big that it doesn’t feel intimate. So – should you see it? Absolutely you should. You should see it for this Dylan song, and for Bill Nighy stepping up the stairs on this song, and for every single twitch of his eyebrows he delivers in this play, for his eccentric way of delivering his lines, for his body language. And for the story which is beautifully humane. I promise you – you won’t regret it, it will make you feel good. Now that I have written it all down, I only have one last problem. I really want to see it again. Great song! I only wish I could see it! I really hate to admit this, but I’m very envious. I live in the States and could not make the trip. It’s so sad.